OMG Posters! » Archive Kevin Tong's Printing Process (Mogwai Poster) - OMG Posters! Kevin Tong just posted a seriously epic and ultra-informative set of photos to his Flickr account. The set chronicles Tong’s process of printing his upcoming Mogwai poster. We are talking 74 pictures with meticulous notes. 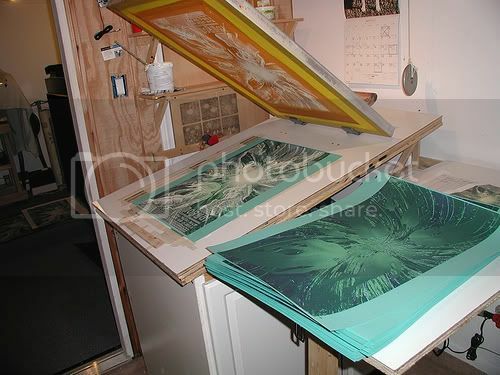 If you are at all interested in the screenprinting process, this link will interest you to no end. Also, you should probably start bugging Kevin about those test prints NOW, those should be pretty scarce. Visit Flickr.com. Fantastic! I kept wondering what the heck went on to make my walls look awesome. Kevin Tong is 100% talent. I hope to buy more of his stuff soon. Discovered him back with those Tom Waits prints and I bought each one. I realized I will never make such posters as I don’t have the attention to detail required. what a great read – Thanks you for all the work / write up on the photos. This dude can’t seem to help but constantly hit it out of the park lately…keep it up Kevin! This is great! Can anyone tell how he has the screen rigged up to pull up after a print – is it just a weight on a pulley? Very cool. Thanks for documenting your process. Thanks for the niceness Jennifer, though I am actually 30 % talent, the rest is sawdust filler and organs. I am glad you all enjoyed this process. I really wanted to show people what many poster artists, not just me, have to go through. My once beautiful hands are now strife with wear and burden! I plan to do some more process stuffs, so stay tuned!